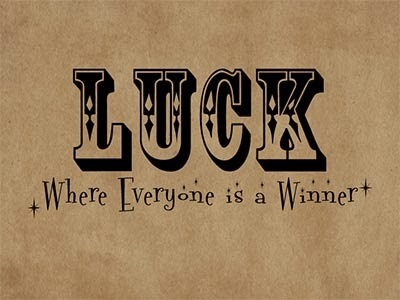 Fortuitous, jammy, miraculous, providential, heaven smiles on you, fluky, as luck would have it, in luck, more by luck than judgment, someone’s lucky day, when your ship comes in. I’ve always been interested in sports. Playing them, not watching them. Annually, throughout my school years, all of us were bussed to another school to participate in ‘Track Meet’. It was our only field trip and a wonderful, joyous escape from the normal, mundane, humdrum grind of daily learning. At the track meet, one would be expected to participate in different events. My specialties were running, long jump, and high jump. And I had been practicing. This was a long, long time ago . . . sigh. At one meet, the hosting school introduced a new event. The softball throw. Okay, it wasn’t complicated. You merely took the ball. My friends encouraged me to enter. I threw that ball clear to the other end of the mapped-out area. Set a record. Of course, I was never able to approach that distance with my other two throws. My second experience was during college, again at a track meet, this time with other people who had trained. I had been practicing my sprint, long jump and high jump. I’m nothing if not predictable. At the meet, someone put a javelin in my hand. With no other training or experience, I took that sucker and threw it. And set a new college record. My teacher, seeing me as some sort of prodigy, grabbed me and proceeded to train. And I never again was able to throw that stupid stick anywhere near what I had that first time. P.S. I’m going out to buy my first, ever lottery ticket. Labels: I'm going to need it! Sometimes, setting a record is a good thing. Sometimes . . . it isn’t. 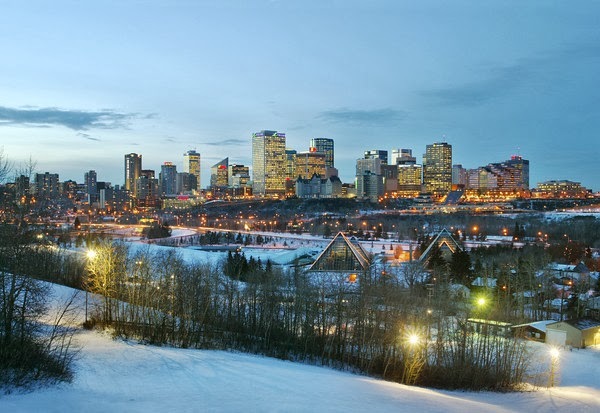 Yesterday, on the 15 of January in Edmonton, Alberta, we set a record for temperature. +10C ( +50F). And wind. 120 KPH (75 MPH). Fortunately, we don’t often get gales of this force up here. But in Southern Alberta, they are quite common . . . In the early days of our marriage, Husby and I bought a mobile home. It was 686 square feet of cozy, happy space. Our little home on wheels came with a small entryway, built by the previous owner and attached to the side of the trailer with an assortment of screws. Husby got the trailer set up. Dug lines for water and sewer. Connected the power. 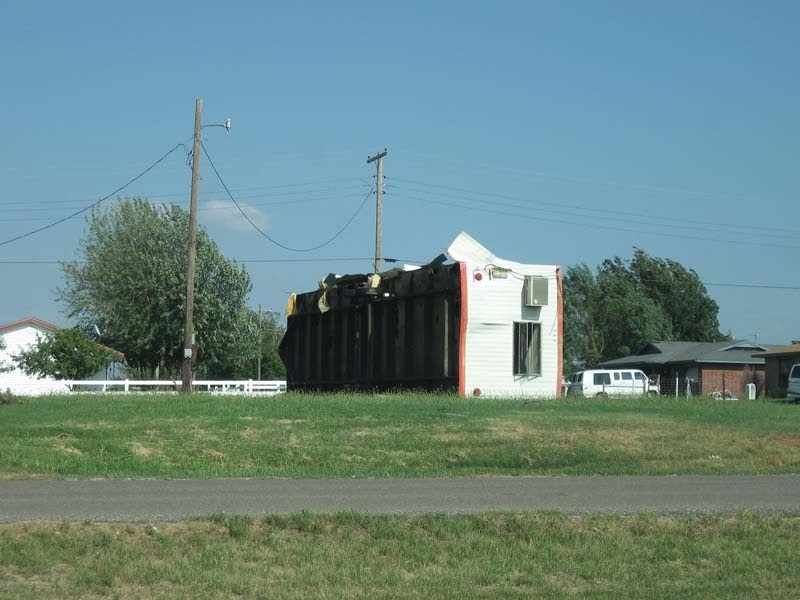 I should probably mention, here, that, in Southern Alberta, mobile homes MUST be set up in an east-to-west direction. If they sit north-to-south, there is a very real risk of having them roll over in tomorrow’s gale force winds. Our little home sat on the bare prairie, fully exposed to the elements, but it presented one of the small sides to the wind. Our bedroom was in the far west side. No problem. And then . . . the wind. During the day, spending our time - as we did - in the center, or on the east end, the wind was merely scary as the trailer shivered with each onslaught. At night, however, it was truly terrifying as we lay in our bed with the floor bucking and hopping beneath us. One doesn’t get much sleep when one is in a constant state of ‘oh-my-goodness-we-are-going-to-roll-completely-over-with-the-next-gust’. One afternoon, I was standing in the kitchen with the wind howling around me. A strange noise had begun. A . . . scraping sound. I waited for the next blast. There it was again. I followed the sound. Right to our little entryway. With each blast, it was being slowly ripped from its moorings. I could see daylight in the cracks. Frantically, I called Husby at work. He hurried home and surveyed the situation. He fired up the tractor and placed the bucket against the backside of the little box, supporting it against the onslaught. Then went back to work. For the rest of the day, I kept an eye on our sad little entryway. Finally, Husby came home for the day. He looked at the entry, creaking and jumping with every gust. Then he reached out and, putting a hand under the step, lifted. The entire structure vaulted into the air like a box-kite and flew 300 feet, landing in the nearby field. You have to know that this wasn’t a little, flimsy, featherweight structure. It was built of solid materials. Walls, floor, roof, doors. And yet it flew 300 feet. Husby then proceeded to build newer, bigger and better. Which lasted until we sold our little first home and moved north. But our house didn’t shake and we could sleep at night. Yep. I'll take the cold. Labels: I'll take the cold. Labels: Breaking the law can be painful. Dishes and I have a history. Okay, yes, I use them at meals. But we regard each other with deep suspicion. I’ve recounted one experience here. But the one I’m about to describe is the first I can remember . . .
On the Stringam ranch, mealtimes were an exciting gustatory trip down the trail to deliciousness. When the meal ended, the work began. Well, for the rest of us. 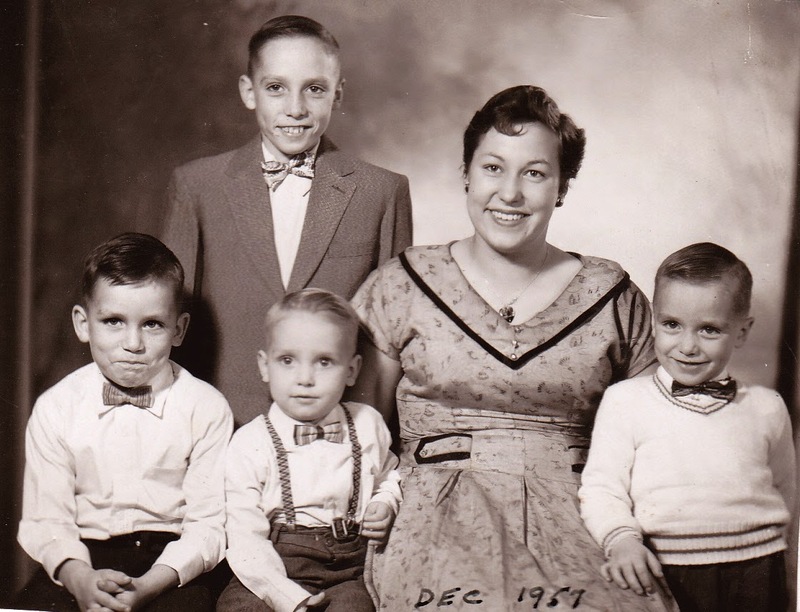 Mom had obviously already been at . . . never mind. The work, for me, consisted of transporting non-breakables from the table to the sink. Yep. The spoons, butter knives and forks were my special friends. Occasionally, I also branched out and dealt with such things as: napkins. Salt and pepper. Toothpicks. My work load was exhausting. Leftovers were carefully covered and stored in the ‘fridge. Anything left on the plates was scraped into one container and taken out to the dogs, who then thought they had been sent to doggie heaven. It was 1960. Doggie nutrition and diet hadn’t been invented yet. On this particular day, the scraps had been placed in my little brother’s ‘bunny’ bowl. A cute little china bowl with a bunny scene in the bottom and bunnies running all around the outside. The favourite choice of the under-five group. Which, at that time, consisted of my brother. I had finished my all-important silverware shuffle and was at a loose end. The bowl of dog scraps. Just sitting there, waiting for some grown-up person to transport it. “Mom! I’m gonna take out the scraps!” I said, in my most authoritative voice. You have to understand that she was busy: effecting the organization of three other children, keeping a watch on the baby and talking to Dad. I grabbed the bowl and headed for the door. Feeding the dogs on the ranch consisted of carrying the scraps across the cement driveway to the far copse of trees beside the old garage and tipping said scraps into the large, metal hubcap waiting there. Now picture several dogs (who had appeared as soon as the door opened) leaping and jumping around like idiots. I suddenly realized why the job of taking out the scraps usually fell to a . . . bigger person. I didn’t even make it across the driveway. Blair’s little bunny bowl was knocked from my hand, breaking in half on impact. The dogs happily started in on the scraps (glass fragments hadn’t been invented, either) and I collected the two pieces and returned, in tears of defeat, to my Mom. And our little bunny bowl was gone forever. P.S. There is a happy ending to this story. 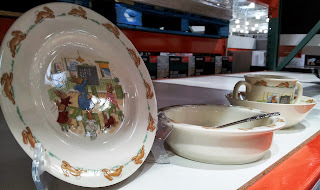 During a recent trip to Costco with my son, I saw something that . . . . well, I‘ll just let you see for yourself. They’re back. Or, in truth, were never, really gone. Just keep them away from me! Husby and I have just spent the past five days with our middle son at his home in Courtenay, BC. They have been days of long, long talks. Walks on the beaches of Vancouver Island. Hikes through thick, soft forests. Soaks in the hot tub. Meals at our favourite restaurant. It has been an all-to-brief dip in paradise. We just finished lunch at a local fast-food restaurant on our way to the airport. The food was very edible. And prepared by someone other than us. My son thanked one of the servers on our way out. to make this for you ! I had taken my three-year-old granddaughter to The Mall. The big mall. The one that covers many city blocks and holds many, many stores and attractions. It is bright. Entertaining. Noisy. Older people ignore the enticement of 'modern shopping gone mad' and use it as an indoor track during the interminable Edmonton winter. 'People-dodging' has become an accepted, even sought for work-out. With all these people and attractions vying (real word) for our attention, it is only understandable that some . . . gentility might get lost. My granddaughter and I were waiting for my son to finish an interview. The choices were, truly, endless. We ordered from a smiling young man. Chicken pieces for her. We found a booth and started eating. Now, I should point out here that, for the most part, I like McDonald's food. Not gourmet, but tasty and satisfying. Even with those expectations, my salad was a very pleasant surprise. In fact, probably one of the best salads I had ever eaten. Crisp where it should be crisp. Cheesy where it should be cheesy. Olive-y where it should . . . you get the picture. I looked at the brightly illustrated billboard to recall what I had ordered. Okay, not quite, but I have to admit that I was certainly tempted. My granddaughter finished her meal. "Come with me, Sweetie." I took her hand and walked back to the counter. A young woman was standing there, smiling brightly. I went up to her. "Hello. May I please speak to the manager?" Her smile . . . dimmed somewhat. "Umm . . . yes?" She started to slide down the counter away from me. I followed. Finally, "Are you the manager?" She nodded hesitantly, by now, her smile all but gone. "Oh, good. Well I have to tell you that I just ordered your Mediterranean salad," I pointed, "and it is probably the best salad I've tasted in my life. Thank you." She stared at me. Finally, my words must have sunk in, because, suddenly, her face lit up. Really. With the biggest smile I had ever seen. "Oh, thank you!" she said, rather breathlessly. The boy who had served us our meal suddenly appeared from the 'food' part of the establishment, where it would seem he had been hiding, and presented me with an equally large smile. I smiled at them and left. I have to tell you that this isn't an unusual thing for me to do. It started when I saw the movie, "Heaven Can Wait", with Warren Beatty. In one scene, he gets up from the very formal meal, served by his army of servants, and pushing open the kitchen door, hollers, "Thanks for dinner!" or something like that. Now I had been raised to always compliment and thank my mother, or whoever had prepared my food in ours or someone else's home. I had just never taken it to the next level. Thanking and complimenting someone you haven't even met. After that movie, I decided to try it. I've now been doing it for years. Almost without fail, I receive surprised, but enthusiastic smiles. A smile, a compliment, and a thank you. It might put some much-needed sunshine into someone's day. I know it did that day, in that crowded mall.